Enjoy flexible, powerful cooking in a compact format with the Tefal Everyday IH201840 Electric Induction Hob, allowing you to cook efficiently in a variety of locations using multiple functions.Portable ceramic hobRest your cookware securely on the durable black ceramic plate that's scratch-proof, easy to clean and highly resistant to the rigours of daily cooking.The IH201840 uses induction technology, which uses a copper coil beneath the hob surface to heat your pots and pans directly. This means you can cook far more accurately as your ingredients receive focused heat.Induction cooking wastes far less heat than gas and conventional electric methods, and it's safer since there's very little residual heat.Versatile cookeryChoose from six pre-set cooking functions on your Tefal Everyday IH201840 Electric Induction Hob, including Manual, Heat Milk, Stew, Stir Fry, Deep Fry and Boil Water. These help you get specific cooking tasks done in less time, giving your cookware and ingredients the right kind of heating for the results you want.The hob offers nine power levels from 450 W to 2100 W to give you excellent control, even though the appliance is small. 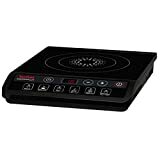 You'll be able to use pans from 12 cm to 26 cm on it comfortably.A real kitchen assetThis Tefal Everyday IH201840 Portable Induction Hob gives you more options with its downsized form. Enjoy an additional, powerful cooking surface for big family events such as Christmas and Easter; or even use it to cook outdoors if there's a power socket nearby. It's so easy to pack away when you're done.Check on hob settings using the LED display control panel, with front-mounted button controls that allow for quick and straightforward adjustment without having to reach over hot surfaces. The integrated timer can be set for up to two hours so that you can prepare your meals exactly as you want them. Don't worry about over- or under-cooking your food again.Safety comes firstKeeping things safe in the kitchen, the Tefal IH201840 Portable Induction Hob features automatic switch-off, over/under-voltage protection and an automatic alarm function - if there is no pan or an unsuitable pan detected on the ceramic plate, an internal sensor system sounds an alarm.Choose the Tefal Everyday IH201840 Electric Induction Hob as an efficient and versatile companion for portable cookery.